What does corporate clean energy and climate leadership look like? Where are companies focusing their efforts? Who’s involved and who isn’t? David Gardiner and Associates (DGA) has a new tool designed to help stakeholders answer these questions. Corporate leadership has become significantly more important in the last two years. The U.S. federal government is absent on climate, greenhouse gas emissions are rising, and the clock is running to mitigate the worst climate impact scenarios: Organizational renewable energy and greenhouse gas commitments are the vanguard of U.S. climate engagement. Municipalities and higher education are important stakeholders, but it’s arguably business—and only business—that has the scale to drive the fundamental transformation climate science demands. *See the Tracker for more information on how we categorized these initiatives. 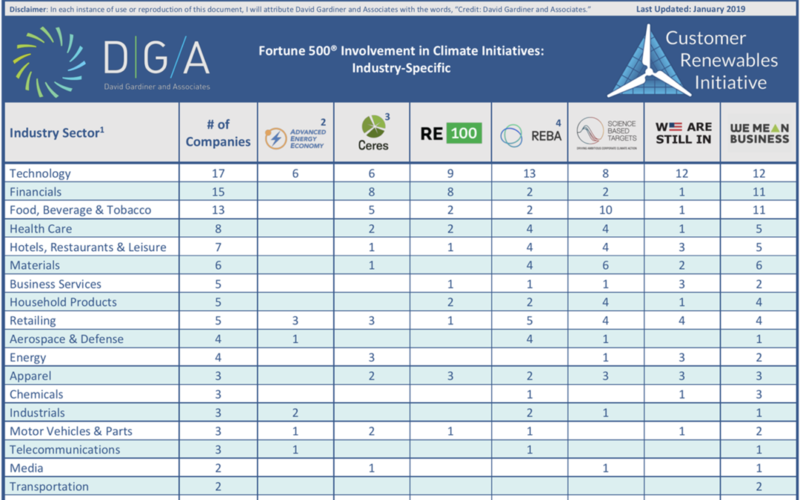 Focusing initially on the Fortune 500, the Corporate Climate Tracker captures summary data across 19 key economic sectors and company-by-company data for every company that participates in at least one of the initiatives listed above; 109 companies out of 500 as of January 2019. The full data by company are available for free download from the DGA website here. The goal of the Tracker is to allow the market to see which companies are engaged and what that engagement looks like. What seems certain is that dealing with climate change will require companies not already listed to engage and expanded efforts from many of the companies already underway. DGA will be updating the Tracker regularly to keep up with companies’ efforts.